well, seems like everyone else has a trailer project going, and i didn't want to be left out. i picked this up from local craigslist ad saturday for $200. it needs some sprucing up but it is solid and pulls like a dream. nice find bro... give ya 250 for it! Looks like a great little trailer Larry.... like you said, a little sprucing up and it will look good as new. does anyone have any suggestions on how to remove the paint on aluminum diamond plate? Do you think paint stripper would hurt it?... or possibly a heat gun? I think I would try a paint stripper first then a mag wheel cleaner that is made for cast aluminum wheels. That should bring it to raw aluminum. If you want to polish it after that use a power buffer. On second thought I think I would try a high pressure washer first. I just noticed it was flaking some. It may just blow off. Paint stripper is hard on aluminum, it accelerates the oxidation process. Try power washing it, the more power the better. it looks like rattle can paint, so a pressure washer might do it. are you going to repaint it? ok, let me hear some opinions. would it look better polished or painted? what color, white to match bike or black? Scheme it... red and white like a coke box maybe... BTW it may be cheaper and give a better result to have it wrapped. If your going to try and polish it back out, here is my suggestion. Part # 503-6177 6" disc with 1/4 inch hole. & a 3/8th drill, decent high speed drill will serve you well through out this process. (1) Arbor 1/2" that will fit in a 3/8th drill. Work 1 section at a time for best results. Use the Enco finishing discs and the 3/8th bolt made in to an arbor, to remove all paint and imperfections. Should take you a few hours. (sorry no short cuts for elbow grease), but the results are worth it. Load up the 8" polishing disc with the aluminum polishing roughe(Small Green Chrome Rouge). That is holding the bar to the spinning wheel until the wheel turns the color of the bar. Buff until blackened and then work until clear. The diamond plate will turn black as you buff, do not worry, go over the area again slowly with same wheel until it shines. Once you get your chrome like finish, your options open up, you can either buff with mothers if you want to maintain it, or you can clear coat it to keep the shine. The clear coat should last you a couple of years, or you can Mothers(aluminum polish) it and maintain it 2 to 3 times a year. Clear coating will require stripping every couple of years as the clear coat discollors, but Mothers can be maintained easily with regular washing, and cleaning with Mothers. Once you have a section done, move to the next. This will make for a very smart looking trailer, with a chrome like finish. This process will also work on the mag wheels on these Goldwings as well. I have used this process on my timing belt covers and rocker arm covers on my GL1200. On the bottom of the second page you can see my polished timing belt cover and rocker arm covers. I chose not to clear coat, and to polish instead. Pressure washer. If not all of it comes off, spray paint stripper and pressure wash. Hopefully the PO did not prepare the aluminum properly and it should just flake off. Do a small patch first to make sure the stripper does not dull the finish to much. Did I mention pressure washer. I took a second look at the pic, the spoiler is a nice touch. The scotch brite pads on a drill will remove all paint and blemishes while not ruining the diamond plate. Paint stripper leaves a nasty black stain in the aluminum. Use the right kind of stripper. 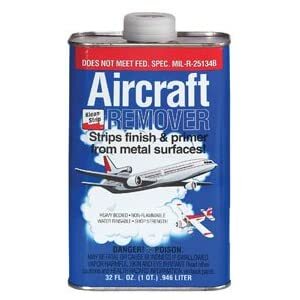 Get a hold of some "Aircraft Remover"
a 3500 psi pressure washer won't touch it. that paint is on there better than it looks. The Scotchbrite pads will take it off. i have some on order. That stripper I mentioned doesn't blacken aluminum like Lucky was talking about, and yes we do use it on aircraft all the time. i'll give it a try. i was just leary about using a stripper. there is about 40 square foot of painted area, will 1 qt. be enough.